Because human studies of the long-term effects of most cosmetics (except, perhaps, hair dyes) don’t exist, there is little evidence to suggest that using cosmetics, or being exposed to the ingredients in cosmetics during normal use of these products, increases cancer risk. Still, because there are no long-term studies, little is known about the health effects of long term exposure to many ingredients in cosmetics. This means that we cannot claim that these products will not cause health problems in some people. We don't support the approach of fear mongering, but we do believe the public has a right to be informed about the unkown saftey of consumer cosmetics. This being said, we understand that we still too have many questions about cancer and the more we understand it, the more we can do to stop it. Which brings us the the other reason that Breast Cancer Awareness is deeply close to our hearts. We have a dear friend whose support and enthusiasm has is many ways kept us going on our journey with Kai-Jo. This beautiful woman's spirit and energy has uplifted us both as entrepreneur and as friends. Her involvement with our work has meant so much to us that we wish to give back as she now is in the physical, emotional and financial struggle that too often accompanies breast cancer. Thanks for all you have done, we hope we can help give back! 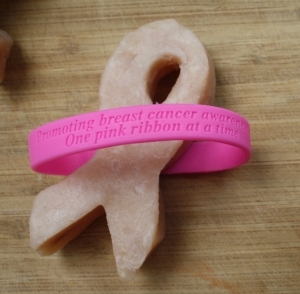 For Breast Cancer Awareness month, we will be donating 50% of our shampoo bar proceeds to the cause. Your support is greatly appreciated.